Excessive tearing in dogs, known as epiphora, can afflict Yorkshire terriers of any age. The causes of epiphora are many and varied, and gunk in your dog's eye can often indicate an eye disease or parasite. 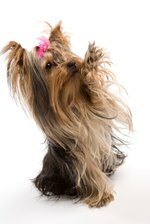 Yorkshire terriers have long, silky fur that can accumulate a lot of dried gunk. Try to keep your Yorkie's eye as clean as possible, but in the case that the gunk dries up around the eye, you can remove it by using a warm saline solution. Put 1 tsp. of salt into 1 quart or warm water and shake or stir the mixture until the salt is dissolved. This saline solution will help clean the area more effectively. Douse a clean gauze sponge in the saline solution and squeeze out the excess water. Hold the sponge up against your Yorkie's eye for about 30 seconds to soften the dried gunk and hardened fur around the eye. Gently wipe the eye clean with the sponge, adding more saline solution as needed. If too much dried gunk accumulates on the sponge, rinse it out or use a new one. Apply a thin layer of boric acid or eye ointment by cupping your hand under the dog's chin and using your thumb to pull down gently on the lower eyelid. Monitor the eye over the next several hours and days. If the discharge continues, clean it off before it can dry on the fur.